Recently, the Greater Kansas City Mothers of Twins Club asked me to write an article for their newsletter. They feature a blogger from their club every month, and I was excited to be the December blogger! Since many of you aren't in the group, I thought I'd share it here as well. Enjoy! Confession: Overall, I don’t like the Christmas season. In recent years, I’ve found December to be exhausting… and not in a good way. I don’t like the stress of making our families happy with enough get-togethers, the commercialism that is everywhere, the crowded stores, the grouchy customers, and the cold temperatures. Lest you think I’m the female version of the Grinch, please know that I really truly do want to enjoy the Christmas season! I want to look forward to family time, special memories, and quiet evenings at home drinking hot chocolate and watching the snow. But I feel like Christmas as it is today has crushed any semblance of “love, joy, and peace” that I can muster up. This week, I’ve been thinking back to my childhood and what I remember about Christmas mornings with my parents and five younger siblings. What was it about those Christmas mornings that made them special? I remember Dad blasting the Manheim Steamroller Christmas CD as we all came down the stairs, the special reading of the Christmas story before we did anything else, my siblings all scrambling to sort the presents into piles, and the orange Danish rolls out of a can that my Mom would buy just for Christmas morning because we would beg her for them. Do you know what I don’t remember? I don’t remember what was in the presents. I remember a few special items over the years: a “grown-up” Bible, an American Girl doll, a dulcimer…but the vast majority of the gifts, I simple don’t recall. It’s not that I’m ungrateful. It’s just that the special family moments of the day seem to have edged out the “stuff” that I was given. I think a common complaint about the Christmas season is the stress to financially, physically, and emotionally meet every need that commercialism throws at us. Well I, for one, am not interested in dreading Christmas any longer. This year will be our second Christmas with kids. I don’t want to continue to passively wish the season away, so I’ve decided to actively change my perspective in an effort to reclaim some of the special wonder that has left over the years. Hopefully, a few changes toward the simple will reduce our stress and increase the joy! 1. Sean and I are discussing Christmas plans with our respective families early this year. We’ve decided that we want to enjoy part of the day with just our kids, so the morning will be spent at home, just hanging out together. We’ve also decided that instead of trying to do both grandparents’ houses in the same day, we will do our Christmas celebration with them on two separate days. It will be less stressful for us and much less stressful for our kids. Truth: We don’t have to celebrate Christmas on Christmas Day for it to count! 2. I’m not going to brave the mad rush at the stores to buy gifts. 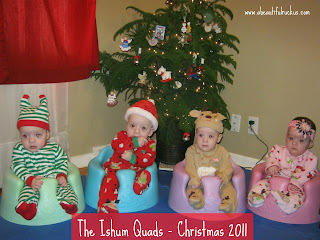 We shopped early by hitting consignment sales for items that the kids might like. We kept it low key (they can only handle so much stuff!) and inexpensive. All of my Christmas shopping and most of their birthday shopping (in February!) was done by September. All I have to do is wrap the gifts with last year’s clearance wrapping paper. Truth: The kids won’t know how much we spent on them, and honestly, they prefer not to wait for us to undo all of the packaging that comes with new toys. 3. Since we are Christians, we want to make sure that Jesus has a special part of the day…it is His birthday after all! We will still read the Christmas story aloud before we get down to the gifts. As they get older, I look forward to making birthday cards with them, and counting down the days until we can celebrate! Aren’t homemade memories some of the best kind of memories out there? Truth: Will they understand all of it this year? Probably not. But it is a great tradition to start early! 4. I love to start new traditions with our family! This year, I’m going to continue with decorating our yearly ornament with special things we did and accomplished, and light luminarias down our driveway. I’m also looking forward to watching a Charlie Brown Christmas, driving around looking at Christmas lights together, and watching the snow fall outside our window as a family. Our December adventures will be spread throughout the month so that we don’t feel the stress of trying to experience it all at the last minute. Truth: Traditions are things that become the markers of the Christmas season. It’s also the special things that kids take with them when they leave home. 5. And because there are just certain things that mean Christmas to me, you better believe that I will pop open the can of Orange Danish rolls on Christmas morning! Watch out kids! You have no idea what kind of treat you are in for! Truth: Orange Danish rolls are a necessity for a perfect Christmas morning (okay…maybe that’s not a truth, but it’s a darn good opinion!). My kids are young enough that some memory makers will be on hold for a year or two (think: Christmas cookies! ), but I want to make sure that as we establish what Christmas looks like for our household, that we put the emphasis on family, experiences, and the Reason for the Season rather than on all the stuff that has become the norm. Long-term, our kids will remember more about Christmas and be able to look back fondly on family memories if we don’t contribute to the harried, stressful season that it has become. 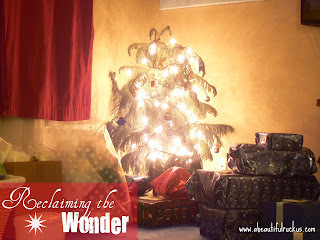 What are you doing to Reclaim the Wonder for your family? Hi Rebecca, Your quadruplets are adorable and I hope to continue reading your blog. I wish your family a merry Christmas! Thanks, Amy! I hope you have a very Merry Christmas as well! Our twins are not here yet, but we decided long ago that we could only do one family a day and there would be no long distance traveling in Christmas Day. We want to be able to enjoy the day without having to rush out of the house first thing in the morning. At first the parents were a little hurt but now everyone has adjusted. Setting boundaries can sometimes be a bit painful for everyone involved, but it ends up being the best thing for everyone in the long run. I'm so glad that you've already put those expectations in place! It will be easier when your babies are here. Oh it's so nice to know I'm not the only "Grinch" out there too! I also have felt underwhelmed with the Christmas joy and peace and quietly begin to dread it in October. I am happy to marrying a man who also prefers a more simple and quiet Christmas without the "hoopla" and knows how to set and maintain boundaries. I think my Christmases will begin to resemble something more palatable to me in the near future . . . Here's hoping our kids all grow up with wonderful memories of delightful Christmases...and no stress!! Absolutely! You have an awesome excuse to take it easy! Sweet Christmas memories is a wonderful goal to have for our families! Wonderful post! Exactly what I needed after two days with hubby out of town and 5 kids activities going on (all require a parent with them). I'm working on that same thing - focusing on what I enjoyed as a kid and making sure my kids have some of their very special moments during the season. I love your orange danish roll comment - for us, it's Sour Cream Coffee cake and fruit salad :-) Merry Christmas! Haha! I love that you have your own official "Christmas Morning Breakfast!" I hope your month slows down a bit so that you can enjoy it with your whole family around you. I'm sure five kids going different directions is crazy! We don't have kids (yet), but we've been splitting holidays for the last four years. One family gets Christmas Eve; the other one gets Christmas day. We also do Thanksgiving and Second Thanksgiving on Saturday. More for everyone, and no one gets upset. That sounds like a great plan! And having it in place now should make it easy when kids come along! Thanks for sharing! Hello! I just found your beautiful blog at "Harvest of friends bloghop". Looking forward to follow you ! I agree...handmade gifts are truly the best! It's so nice that you keep Jesus as the focus of the holiday!